Updated on 28 May 2017: As of Version 1704 (Build 8067.2115), this bug has been fixed. Updated on 21 April 2017: See here. Updated on 12 April 2017: See here. This bug report has been submitted to Microsoft since 13 December 2016 via multiple channels. It is officially reported via Customer Support on 12 April 2017. You have set an Exchange account and an IMAP account in the same profile. You try to reply to a message sent to the IMAP account. When the reply message is created, the default ‘From’ address is not the address of the IMAP account, but of the Exchange account. If the mail is sent without editing the ‘From’ address, the mail is sent by the SMTP server of the IMAP account with the address of the Exchange account, resulting a erroneous message. One is to remember to edit the ‘From’ address each time replying a message in the inbox of the IMAP account. Another workaround is to use separate Outlook profiles for IMAP/Exchange mailboxes. The following is a comprehensive description of the bug. Please do not hesitate to write me for further discussion on the problem, Microsoft. For those people not working on this issue, please feel free to use the comment system for discussion and spread the article so that your friends are aware of this. Create a new Microsoft account with a new Outlook.com address. This Microsoft account will have an Exchange-based inbox. This step can be replaced by preparing any Exchange-based mailbox such as Exchange Online Plan 1. We will use Exchange address to denote this email address later. Create another email account from some provider that supports IMAP. In my case, I have an email from my school. We will use IMAP address to denote this email address later. Add the Exchange account. Upon finishing adding the account, restart Outlook to finish configuration. Make sure the Exchange account works properly. Add the IMAP account. Make sure that the IMAP account works properly (receiving and sending mails). Set signatures for mails sent from / replied from both mailboxes. Set different signatures for the two accounts. Add a signature named ‘Sent by Exchange’, of which the content is ‘Sent from an Exchange account’. Set the default signature from the Exchange account Exchange address (new mail and reply) to the ‘Sent by Exchange’ signature. Add a signature named ‘Sent by IMAP’, of which the content is ‘Sent from an IMAP account’. Set the default signature from the IMAP account IMAP address (new mail and reply) to the ‘Sent by IMAP’ signature. Receive the mail sent to the IMAP account in step 5. In the inbox of IMAP account, click the mail to display it. Either let it display in the reading pane, or double-clicking it to show it in a new window, is acceptable and is able to reproduce the problem. Press Ctrl+R, or click Home (Ribbon tab) > Reply (for message displayed in the reading pane), or click Message (Ribbon tab) > Reply. A new message is created for you to reply the message sent in step 5. The reply message might appear in the reading pane or in a new window, depending on prior operations. Both are acceptable and are able to reproduce the problem. Observe the signature of the newly-created reply message. It's the ‘Sent by IMAP’ signature. This is an expected behaviour since we are replying a message in the inbox of the IMAP account. Observe the ‘From’ address (shown as text next to the ‘From’ drop-down button). It's the address of the Exchange account Exchange address. This is an unexpected behaviour. The mail is sent by the server of the IMAP account with the credential of the IMAP account. The sender address is the address of the Exchange account. 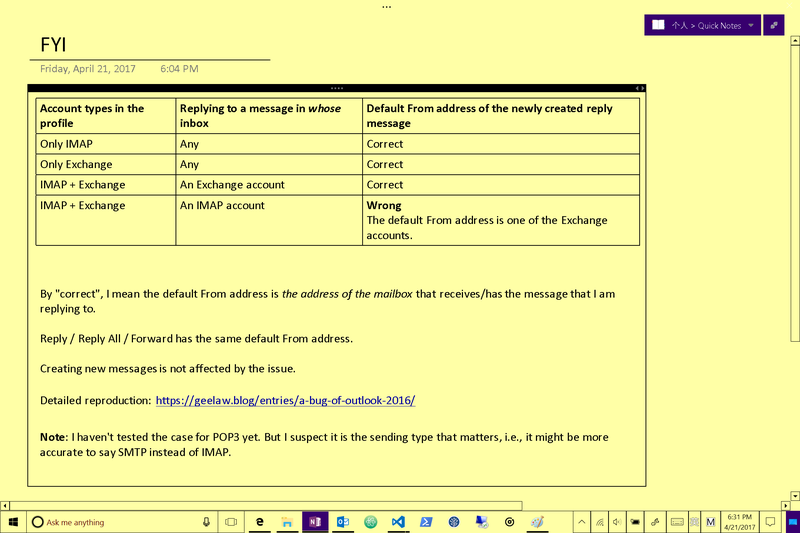 And the receiver can notice the ‘IMAP address on behalf of Exchange address’ when he/she receives the message. This is an unexpected behaviour. For privacy reasons, the screenshots are only available to Microsoft upon request. If you have an Exchange account and an IMAP account set up in the same profile, when replying a message in the IMAP account, the default ‘From’ address is wrongly set to the Exchange account. If you do not edit the ‘From’ address manually, the receiver of the replied message will see ‘… on behalf of …’, which might be considered as a spam/phishing mail by modern junk mail classifier. Outlook should use the email address of the account which the message resides in as the default ‘From’ address. This is the only expected behaviour. If you have two Exchange accounts and another IMAP account, replying from either Exchange account works perfectly and, however, when replying a message in the inbox of the IMAP account, the problem reproduces. That means, Exchange mailboxes does not suffer this problem. If you have no Exchange accounts and only IMAP accounts, replying from any IMAP account works correctly. That means, the problem only occurs if you have both Exchange and IMAP accounts in one profile! Not hearing back from Microsoft after I have tried to report the issue via multiple channels, I decided to contact Microsoft Office Customer Support. The first technician read my blog entry and filed a case. But before I could demonstrate the issue, it was time for dinner and I left the session. Later, when I returned, I reconnected and gave the second technician (Pirajth R., if I recall correctly) my case number. Then the technician connected to my computer with LogMeIn and checked several settings of Outlook. Unfortunately resources available at that tier was not enough to resolve the issue (because it’s software bug). I then created two new Microsoft accounts to demonstrate how Exchange accounts were able to work together in the same profile. However, I did not find a handy IMAP service provider so I did not demonstrate the issue of having both Exchange and IMAP accounts in the profile starting from a fresh Outlook profile. The technician was one of the most efficient and knowledgeable technicians from Microsoft I have worked with. He then documented the details and escalated the issue to tier 2. I will be called back by a tier-2 technician on 18 April 2017 in the afternoon (afternoon in Central European Daylight Time). It is also noticeable that one of the technicians told me since I have Office 365 (Home or Personal) subscription, the support is free. From the support experience, I would surely recommended Office 365 over any fixed version of Office software. And there is an anecdote. When I asked the timezone of the representative, he said it was IST (UTC+5:30). I was talking to him around 10 PM in CEDT (UTC+2). So basically it is midnight in his timezone. I thought I was talking to someone in the United States so it is their working time now! (Only later I realised that it could have been Easter holiday, thus not working time!) I wish Microsoft accomodate proper working hours for staffs in different timezones. The callback from tier-2 team was scheduled on 18 April, but the call did not come through. After the time window of the call, I received an email from Microsoft saying they was unable to contact me. It might have been some international calling issue, or perhaps they are out of hands. Anyway, I replied to them to reschedule the time. The new callback time is on 21 April from 4 PM to 6 PM in UTC+2 (Central European Daylight Time). It is now 21 April. However, I did not receive a single ring until 5 PM. So instead of waiting, I decided to expedite Microsoft. I first tried to Skype call +1 (800) 642-7676. There was an answer and the assisstant is quite helpful in listening to my suggestion not to go over the issue himself, because it has been escalated. He then redirected me to the tier-2 technician, which just gave me unending on-hold music, which is quite freakish to me. When the call time almost built to 20 minutes, I just hanged Skype. And unfortunately it still cost me 😐. I decided to try a different way. I started another online chat with Microsoft Support, told the tier-1 technician my incident number and asked her not to go through my issue herself — though she didn’t take my advice. I asked her to expedite the callback and voilà, a call from Microsoft Denmark rang my phone. The calling person was a tier-2 technician. Through talking, I could infer that he barely knew anything about the incident. He asked me to connect to my computer (via LogMeIn, of course) and demonstrate (read ‘reproduce’) the issue and let him do some fiddling on my settings. He was doing exactly what the tier-1 technician did! I am somehow fed up with the inefficiency, but still proceeded to do what he asked me to do. During the demonstration, he asked me when I started to notice this issue, and I replied December 2016. Perhaps that added some emergency-ishness to the incident. I further explained what would happen for different combinations of account types in a profile. He then tried to reproduce the issue on the lab computers. Not to mention that this has also been done by the tier-1 technician. Well, he did better because he did a thorough experiment. He tried combinations of IMAP + IMAP, Exchange + Exchange and IMAP + Exchange, and the behaviour was exactly the same as I described. He then confirmed to me that this issue will be reported as a critical bug in Outlook. If lucky, an update should be rolling out via Windows Update in 3 weeks, but no guarantee is made here. I am quite excited that I might be making contribution to things rolled out via Windows Update! That’s huge! My feeling is that, though what he did is almost the same as the tier-1 technician, he is indeed better at escalation since he has a higher starting point. I also would like to question incident management in Microsoft Support. It seems to me that I was not contacted because everyone is occupied by other incidents, even if we have made arrangements beforehand! And I am very sad that the technicians never seem to read my blog entry. Let’s pray that Microsoft put priority on this bug and fix it as soon as possible. Updated on 28 May 2017: This bug has been fixed. Anecdote One interesting thing during the call is that I was using my Yellowish Moderate Contrast theme, which might scare the technician. Also, I have little confidence that the technician will look at my blog, so I made a simple summary of the issue during his reproducing the issue on his side. Below is a screenshot of the summary.